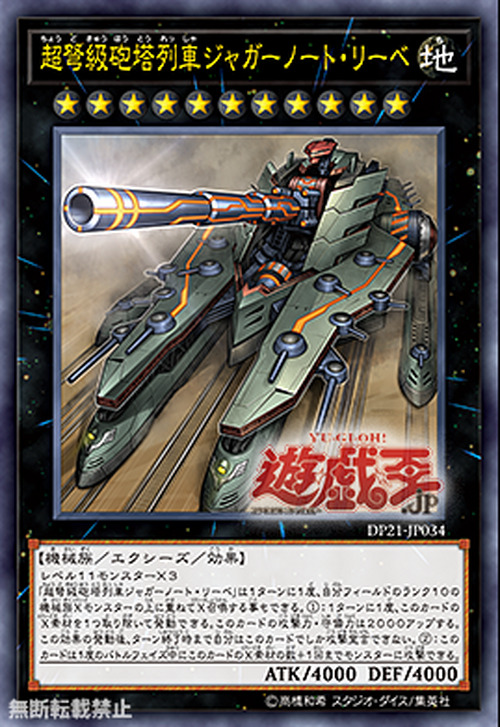 Once per turn, you can Xyz Summon “Superdreadnought Rail Cannon Juggernaut Liebe” by using 1 Rank 10 Machine Xyz Monster you control as material. (Transfer its materials to this card.) Once per turn: You can detach 1 material from this card; this card gains 2000 ATK/DEF, also other monsters you control cannot attack for the rest of this turn. This card can make a number of attacks on monsters during each Battle Phase equal to the number of its materials +1. This monster appears in the artwork of Barrage Blast. This monster is possibly based on the Landkreuzer P. 1500 Monster, a German prototype self-propelled gun. It was conceived as a platform and upgraded version of the Dora and Schwerer Gustav rail cannons; making them overall more powerful and self-propelled. This is reflected in the card effect, as it can be overlayed over either Number 81: Superdreadnought Rail Cannon Super Dora or Superdreadnought Rail Cannon Gustav Max. It also has higher ATK and Rank than either of those monsters, reflecting its superior firepower. This is the only Railway Xyz Monster not to be named after the machine it was based on. Contrary to this monster being a giant artillery rail cannon, the Liebe in this card's name means love in German.